Montana, the original name of the farm, dates back to the early 18th century and was saved from going to ruin by the present owner, Wolfgang Beitz and his wife Dagmar. They restored the existing buildings to their former beauty with slightly modern undertones by creating a classic, yet stylish, feel with hints of African artefacts combined with pieces from a bygone era. The old and traditional farmhouse is about one hundred years old. It is this farmhouse, as well as the Milk Stall and the Old Shed which have been restored and is now our luxury en-suite accommodation. 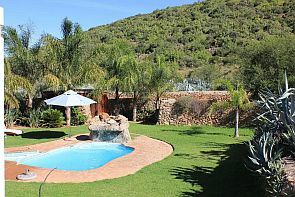 Situated in the Cango Valley, 12km outside Oudtshoorn, Die Fonteine (owner managed) features elegant, air conditioned rooms and a patio overlooking the Schoemanshoek Valley as well as the Swartberg Mountain Range. Our modern, en suite bathrooms have victorian bathtubs and walk-in showers.